Michael Mastromarino, the leader of the body-snatching ring that plundered the corpse of broadcaster Alistair Cooke apologized to the victims as he was sentenced to 18-54 years in prison. “I am deeply sorry for all the emotional pain I have caused to donor families and donor recipients,” he told the Brooklyn Supreme Court in New York. Mastromarino once ran a dental practice on New York`s Fifth Avenue specializing in dental implant surgery. But he was forced to surrender his dental liscence and go into drug rehabilitation after he allegedly abandoned a patient under general anesthetic and was found in his office bathroom with a hypodermic needle in his arm. 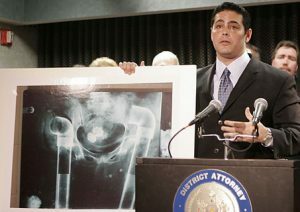 At a hearing last month, Mastromarino apologized when confronted by angry victims – including a woman who had received stolen bone. Dayna Ryan told the court she was infected with Hepatitis B after receiving an implant of stolen bone in spinal surgery. “His sick, disgusting, appalling actions, all in the name of greed, have devastated my family,” she said. Two other members of the body-snatching ring had already been sent to jail.